A block of flats has been evacuated after a suspected gas explosion in one of the apartments. Tyne and Wear Fire and Rescue Service said casualties were reported but injuries are not thought to be serious. The blast blew open the front of a flat in Collingwood Court, Washington, Sunderland, at about midday. North East Ambulance Service said one person had been taken to Sunderland Royal Hospital. Crews from three fire stations attended. 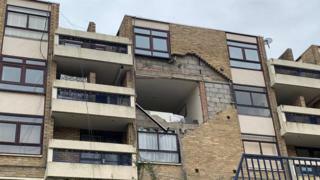 Bricks and a window of a flat on the third floor of the four-storey block flew out in the explosion, leaving a living room exposed. A man visiting a friend two doors away said a man was inside the flat when it happened. "I didn't hear anything but you could feel it through the floor when the wall hit the ground and I saw the big hole," he said. "I've never seen anything like it. The guy was inside but he is fine. "He could have been blown out of the window."